Full flavoured Rabbit with juicy cranberries and root vegetables make this a tasty complete and balanced meal that’s packed with wholesome goodness. Grain free. Chicken Free. Single protein meal. Ingredients: 80% Rabbit, 5% Peas, 4% Swede, 4% Carrots, 4% Cranberry, Spinach (1%), Yucca Extract, Green Tea Extract, Grape Seed Extract, Dicalcium Phosphate. 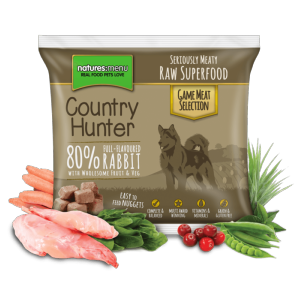 I Love this product, especially as my dog can only eat rabbit !! Convenient size for my 4 dogs.